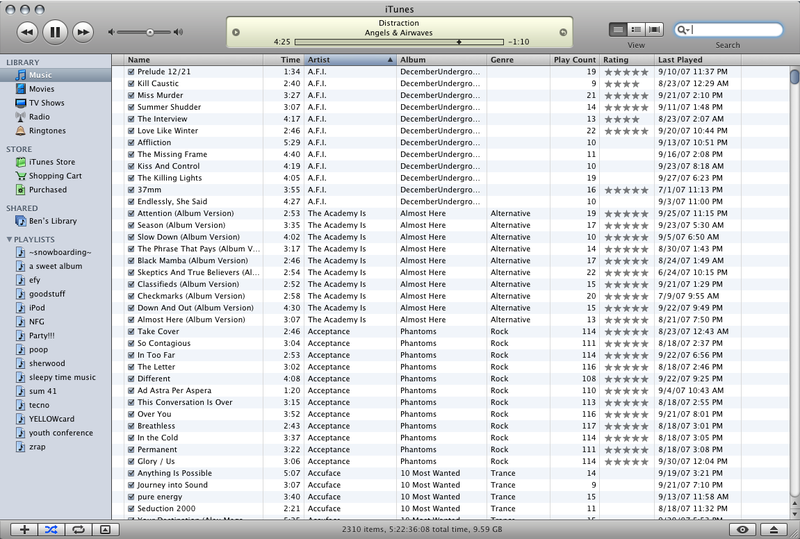 I never realized how much I relied on my iPod until it deleted all of my songs. For years I had stored songs just on my iPod instead of in iTunes because I had run out of space on my external hard drive and I figured, “I will never remove these songs from my iPod anyway so why waste the space?” I figured out rather abruptly last week the answer to that question: “Because any Apple product will inevitably fail and cause painful realizations.” So when my iPod display read, “No Music” I sat there staring at its little screen while a part of me died. First I set about figuring out how much music I had legitimately lost. Luckily for me I kept CDs from my favorite groups/artists and I was able to copy them once again into iTunes, but for some others, some of which are rare tracks/albums I have no recourse to get them back. A few years ago I copied my entire iTunes to a series of data CDs that were supposed to guarantee that something like this never happened, but of course since then I’ve added nearly 60,000 songs to my library, oh, and I lost the discs anyway, so it was of absolutely no help. At first when I look at my library it looks normal, every song in its place, every album meticulously detailed and digitally shelved in alphabetical order. But then I look closer, and I click on a song, then hold my breath. Because I’ve learned that it’s not about appearances, but about whether or not the song plays. If the song doesn’t play after I click on it then I know that it’s a ghost, and I can begin the period of mourning. This has been a sobering process indeed. You see, a lot of the music I lost could be characterized as impactful when it comes to moments in my life. Sheryl Crow’s “Strong Enough” got me through some hard times, while “Dre Day (And Everybody’s Celebrating)” kept me sane back in college. Saving Jane’s “Girl Next Door” was an anthem for us misunderstood and overlooked kids everywhere, and “Enter Sandman” by Metallica was my classic headphones song, the one I cranked up and just blissed out to. I have begun the process of picking up the pieces, but it hasn’t been easy. Every night I spend about an hour upstairs trying to find backup files for the songs and albums I need most, like Ed Sheeran’s “X,” Sammy Hagar’s “Marching to Mars,” and Lionel Richie’s “Dancing on the Ceiling.” I wonder why Hole was spared while my N*Sync catalog got decimated. Was it the universe’s way of saying that my musical priorities are all screwed up? I guess I’ll never know, but that won’t stop me from guessing. It has been painstaking to find and re-copy music, but I’ve been somewhat successful doing just that. And the library will help me with some more. So, while Matchbox Twenty won’t be revived anytime soon in my iTunes library, I can now once again listen to Better Than Ezra, Shania Twain, The Rolling Stones, and Robyn, and I’m only a few days away from bringing back Sia, Robin Thicke, Jason Mraz, and the soundtrack to Mockingjay, Part I. Until then I’ll keep piecing together what I can, and continue mourning those I know I’ll never find again unless I’m extremely lucky. And I’ll keep clicking, and hoping. You can say that again! I feel like I’m drowning trying to get this back together without losing too much. 60,000?? Ouch. Yeah, crashes hurt. I’m still trying to pick up the pieces.